CLEVELAND (AP) — Josh Gordon’s strange, stuttering career will start anew in New England. Bill Belichick and Tom Brady have a new offensive toy. The Browns severed ties for good with the problematic wide receiver by trading him to the Patriots for a fifth-round draft pick on Monday, ending a relationship the team did all it could to save. 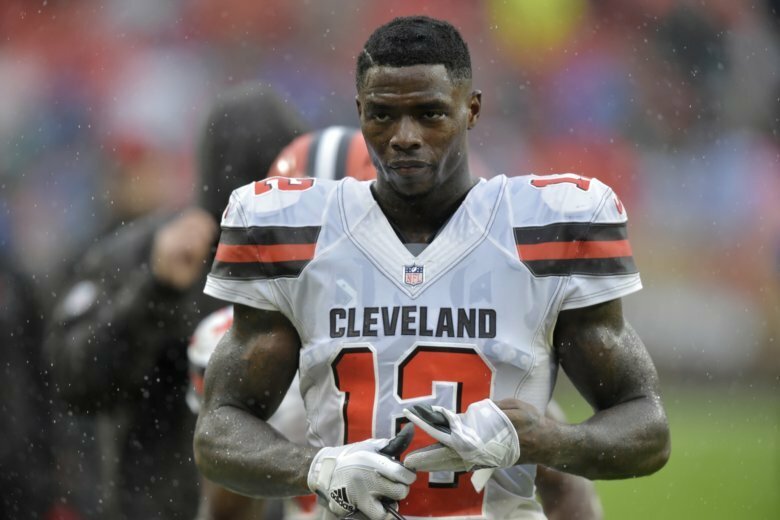 The deal came together two days after the Browns reached a breaking point with Gordon, who has been suspended numerous times by the NFL for drug violations since Cleveland drafted him in 2012. “He is gone now,” coach Hue Jackson said. Gordon played in the Browns’ season opener against Pittsburgh, but he reported to the team on Saturday with an unexplained hamstring injury after practicing all week. The Browns decided to leave him behind when they traveled to New Orleans, and later said they intended to release him. However, Cleveland general manager John Dorsey found there was a crowded market for him and worked out the swap with New England, which will also get a seventh-round pick. The Browns have been supportive of Gordon, but the team felt betrayed and decided it was time to move on. Gordon’s tantalizing talent had caused the Browns to hang onto him while he dealt with drug and alcohol dependence going back to his teens. He missed training camp to receive treatment and the Browns were cautiously optimistic he would help them this season. But he again let them down, and Jackson acknowledged the separation was necessary. Gordon’s departure will expand rookie Antonio Callaway’s role. Callaway caught a 47-yard touchdown pass in the final two minutes Sunday, but the Browns were beaten 21-18. Also, the Browns added some depth Monday by signing free agent Rod Streater, a sixth-year veteran who has played with Oakland and San Francisco. Gordon’s former Cleveland teammate Corey Coleman — who had his own issues with the Browns before being traded last month to Buffalo, cut and then signing with the Patriots — was released by New England. Belichick has a long history of reclamation projects with castoffs, including Randy Moss, Chad Johnson and Aqib Talib. The Patriots coach will try to work the same magic with Gordon, a 6-foot-3, 225-pounder with a dazzling blend of size and speed. In his second season, Gordon led the league with 1,646 yards receiving and scored nine touchdowns. He had a memorable 80-yard TD catch against the Patriots, turning a short catch into an electrifying run on which he made New England’s defenders appear to be standing still. But that was in 2013, and Gordon has played in just 11 games since because of his off-field issues. Still, he’s regarded among his peers as one of the game’s most talented players. He’s joining one of the most stable and successful organizations in pro sports, and Gordon has financial motivations to produce. He’s making $790,000 this season — a relatively low figure among star receivers — and if he stays clean and catches the ball, he could cash in as a restricted free agent after the season. Gordon can potentially help a New England receiving group that has undergone numerous changes since the offseason departure of Danny Amendola as a free agent and trade of Brandin Cooks to the Los Angeles Rams. The Patriots took another hit when Julian Edelman was suspended for the first four games for violating the NFL policy on performance enhancers. The upheaval left Chris Hogan, in his third season in New England, as the Patriots’ most-tenured receiver and there has been a constant shuffling of receivers on the depth chart. Brady did his best during their season-opening win over Houston to spread the ball around, completing passes to eight different players. Seven different players caught at least one pass in Sunday’s loss to Jacksonville, but the Jaguars’ defense was able to key on tight end Rob Gronkowski, holding him to just two catches for 15 yards. AP Sports Writer Kyle Hightower in Foxborough, Massachusetts, contributed to this report.